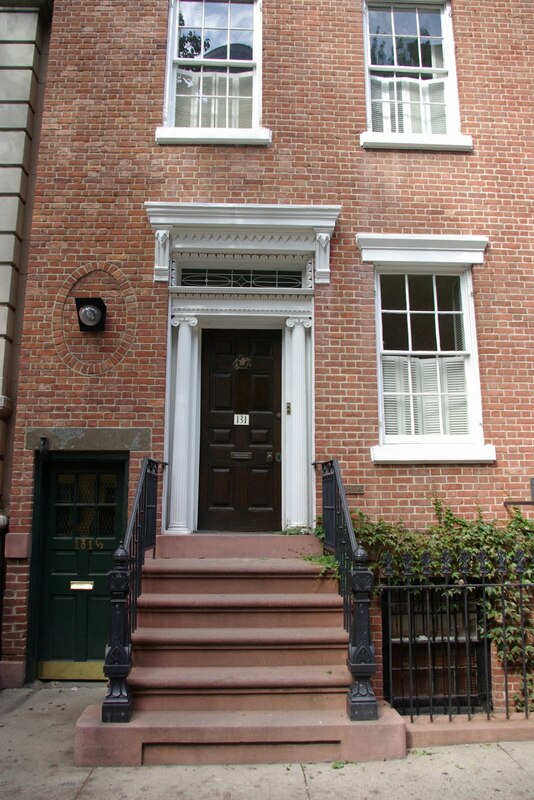 By the 1830’s Greenwich Village was filling with the handsome brick homes of working class families. Block after block of Federal houses were built by carpenters, builders and other skilled laborers, creating a charming and stable neighborhood. 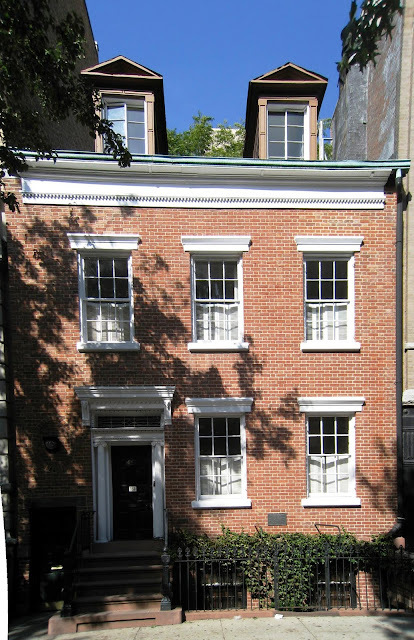 Among them was the home of David Christie who spent about $2,600 to build his red brick, two-story house in 1834 at No. 131 Charles Street. Typical of its neighboring buildings, it featured a peaked roof with two paneled and pedimented dormers; a wide bead board beneath the eave, six-over-six paned windows with simple sills and lintels and elegant Flemish bond brickwork. A handsome wrought-iron fence protects the English basement and a low brownstone stoop rises elegantly to the doorway. It was here, in the entranceway, that Christie spent extra on ornamentation. Two wooden Ionic columns flank the eight-paneled doorway, over which sits a delicate leaded over light, surrounded by carved wooden framing. A particularly attractive small oval window pierced the brick façade over the door to the horse walk which lead to the back of the property. Despite being only a few blocks from the riverfront, the neighborhood remained respectable. 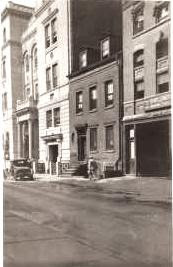 Christie’s family remained at 131 Charles for 30 years, selling it and moving away in 1864, just before the close of the Civil War. Remarkably the residence remained a single-family home well into the 20th Century. During the late Victorian Era, the owners cautiously updated the doorway by removing the Federal-style lintel and replacing it with one in the then-modern Eastlake-style. The interesting oval window was bricked up at some point, as well. Little by little commercial buildings encroached on the Charles Street neighborhood. The grand Beaux Arts style Charles Street Police Station was erected next door in 1897, squashing No. 131 between the tall building to the East. The owners, however, one after another, never relinquished the residential purpose of the house. In 1957 esteemed photographer Diane Arbus moved into the little building in the rear of No. 131 Charles, using the charming horse walk doorway to come and go. Arbus lived here until 1966 during which time her first exhibition at the Museum of Modern Art was staged and she received two Guggenheim Fellowships. Aside from the replaced horse walk door and the Eastlake-style doorway lintel, the Christie house is remarkably unaltered. Even the windows retain their original 1834 wooden frames. Once typical, it is now a relatively rare example of Federal working-class residences in Manhattan. Labeled by the Landmarks Preservation Commission as “charming” No. 131 Charles Street still manages to be a home.